My dev box is a Windows 7 machine and I am trying to install SQL Server 2008 R2 Management Studio. When I run the installation SQLManagementStudio_x64_ENU.exe (downloaded from Microsoft site), it complains with the following error message. I do not have Visual Studio 2008 installed on my machine. I do have Visual Studio 2010 Ultimate and VS 2005 installed on my machine though. 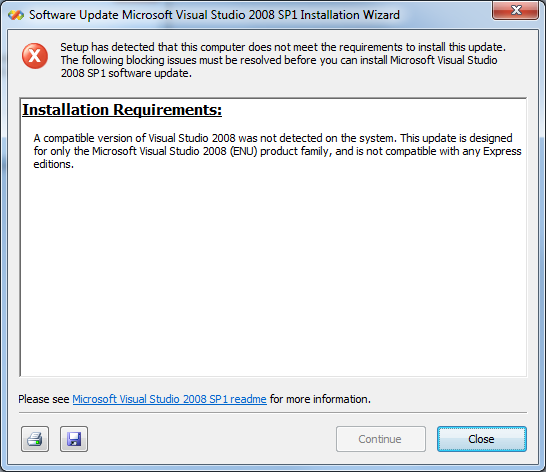 Now, I downloaded Visual Studio 2008 SP1 and tried installing that, it came up with the following error message. Any idea why it is complaining in the first place and pointers as to how to resolve it? UPDATE: Apologies! I just double checked and found that there are a bunch of Microsoft Visual C++ 2008 Redistributable - x86. Could this be the cause of issues? I will uninstall these and see if that fixes my issue. SQL Server installs a version of Visual Studio itself - rebadged as Business Intelligence Development Studio. Do you have a previous version of this installed? Is your version of VS2010 fully up-to-date? I vaguely recall I had this problem on a new development machine (VM) early this year. Unfortunately, I just rolled back the VM and installed SQL 2008 first before anything else. Not entirely helpful, I know. Not the answer you're looking for? Browse other questions tagged visual-studio-2008 sql-server-2008 or ask your own question. How do I configure SQL Server to allow other users to access a database? Why Intellisense doesn't work in SQL Server Management Studio 2008 R2? How to start/open SQL Server Express 2008 in Visual Studio?